I am over these coming months in my spare time work on a beautiful concept by Hayun Lee, but as a girl instead of a guy. My goal for the project is for the character to be at a quality for a AAA game. 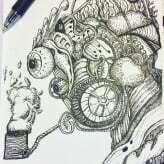 Any feedback would be welcome as I really want to push myself as far as I can on this project. Currently I have as of now blocked in all the major elements, and for the face I have got the base up. Moving forward my focus will be on the face, hair and the hat. But I will try to work a bit on as many of the elements as possible to keep the quality going up relatively consistent. 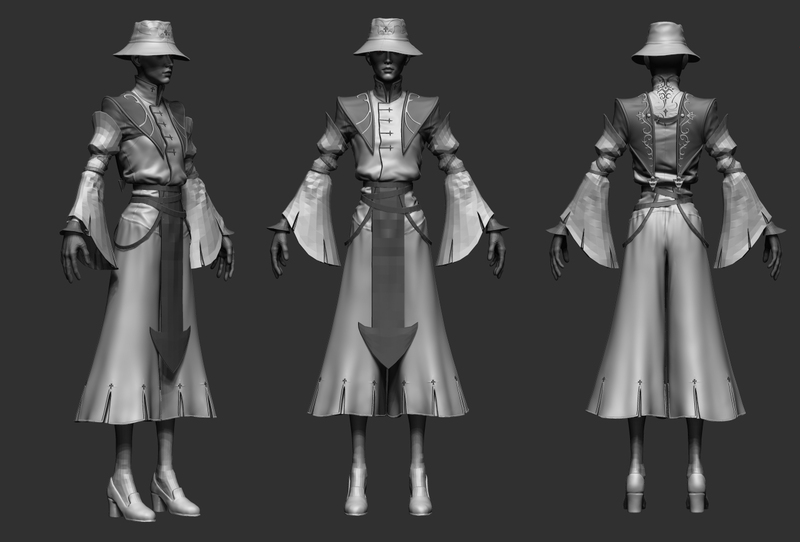 I have started to polishing some of the cloth elements, so the hat and the Shoulder pieces got some love. I got some more work on the coat this morning. I still got the bottom part left of the coat, and then to polish up the other parts. I worked some more on the coat. I will keep on trucking with the arms now. I have now refined all the element except for the belts and some minor details like smaller crosses and spikes on the shoes. 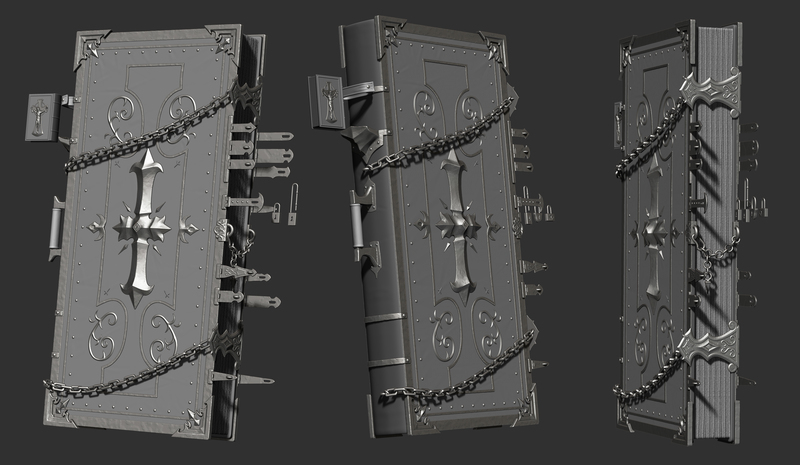 So next up is to take another pass on the highpoly to get in that next level of detailing. 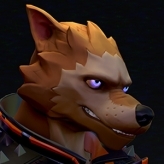 So that means I will try to finish up the face under the coming week. Hey shes looking really good! Youve matched the concept pretty well. Id say take another look at those folds above the belt line. Also possibly make the crease between the legs on the back a bit less obvious, less trouser-like and more long skirt. The straps coming off the belt are a bit too thin compared to the concept. 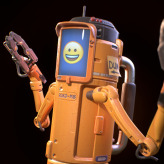 @Pav3d I am a huge fan of your work, so thank you for taking the time to give me this feedback =O! You are spot on with your observations, just a clarification on the crease between the legs. Are you thinking of either the seam line in red, the folds going down in blue or are you thinking of the entire distance between the fabric between the legs making it look like strousers? Ahh I see what you mean =P Yea that one picture really helped me out when trying to figure out what she is wearing. I have now blocked in all the elements of the body, all the small crosses, spikes and such. So I have now started to work on the face where I am aiming to finish the first piece of the highpoly. 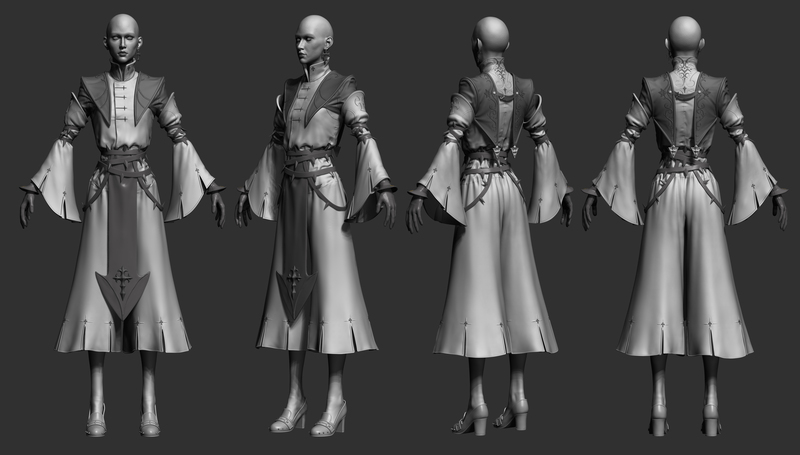 I will address the feedback from Pav3D when I get to polish up the coat. So those folds will be taken care of. I have over this weekend made a lot of minor tweaks from various sources of feedback. I went over all the folds on the waist line, softened up the fabric and made some more detial work plus changes to the face. 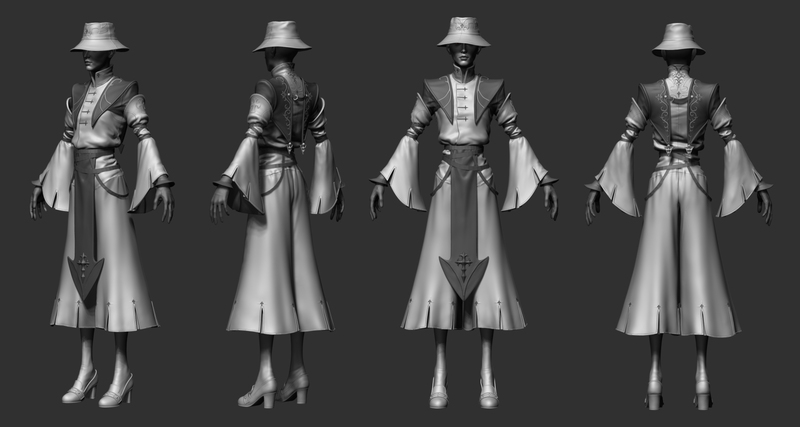 So now I feel that the face is done, and the coat is pretty much done as well. Hey Nuclear, sweet progress! The clothing design details on the shirt look awesome. For the design on the center back did you mask and extract? 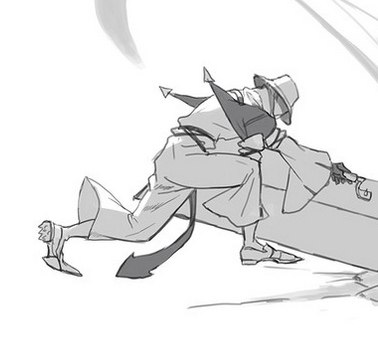 I love the character design and the character sheet layout illustrating all the details. 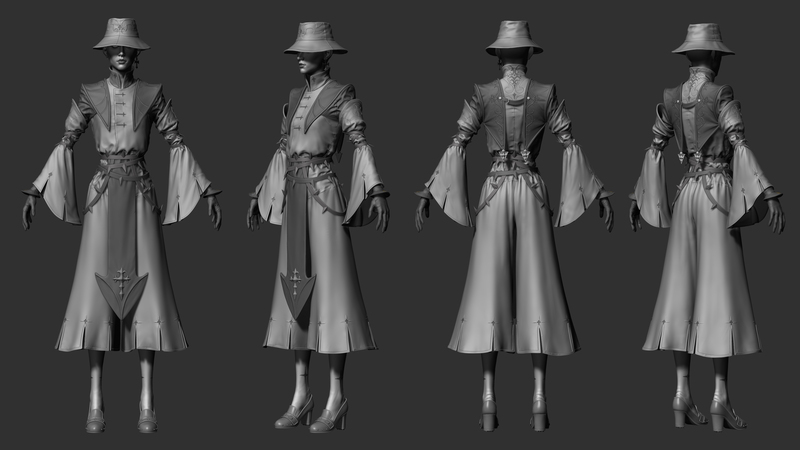 Great work nonetheless, I look forward to seeing the model all textured! Damn you are entirely correct on that the belt loops are a bit to slim. Great catch thank you. And regarding the details on the back you are entirely correct. 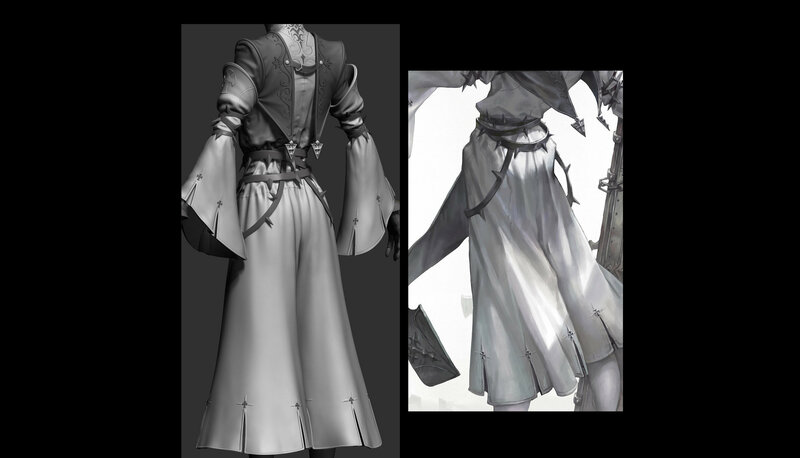 I mask details on the semi finalized coat and from that extract with 0 thickness. Then I work on the flat plane and retopo it the fastest way possible, usually zremesher is enough, but I clean some of the spikes up in Maya to get as clean as possibly I can. Then I give it thickness with panel-loops and detail them. I have got the arms polished up as well as the gloves. Next step is to have all the straps, socks and shoes to polish up. Thats a tough concept to work with, right now you are killing it. keep it up! Looks great. Love the layers. @kanga @artofmars Thanks a lot you two! 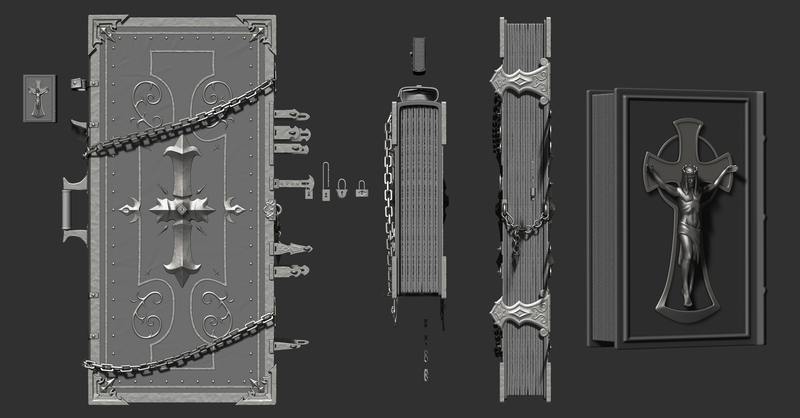 I have finished up the highpoly of the body now so I have the two books left. 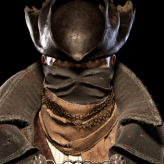 Bloody awesome details on the clothing! Now onto hear giant book haha, I'm interested to see how that turns out. The character design page illustrating the use of her book is hilarious. I wonder what's filled in those pages that makes her want to beat up the book over the ground. Very unique concept and really good execution from your part, looking really good so far. 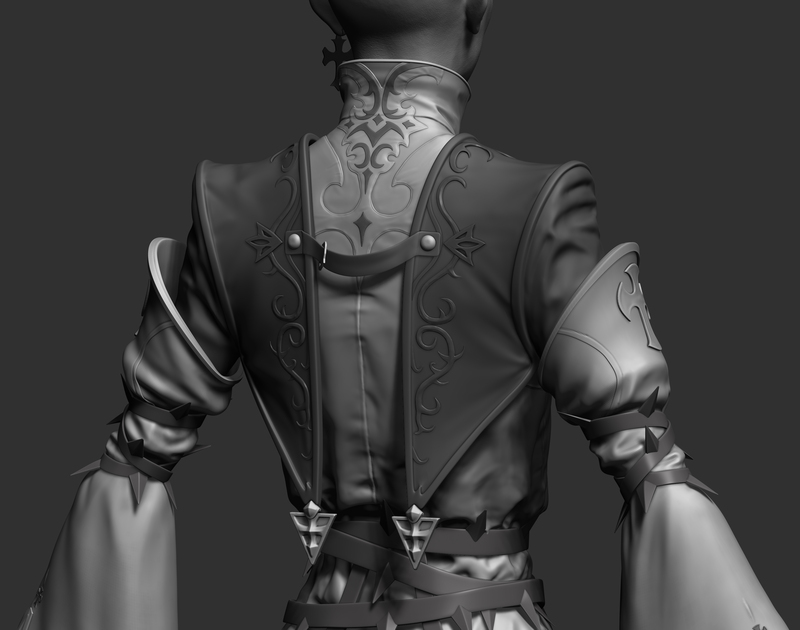 I don't know if you are going for full realism or more of a semi-realistic style but I think some parts could use more memory folds to make the fabric look more believable. 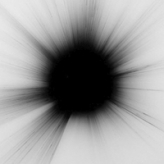 Although it you are going for a cleaner somewhat stylized look then probably better just how it is. @AndresZambrano Thanks for your kind words, and you are entirely correct on the lack of memory folds. 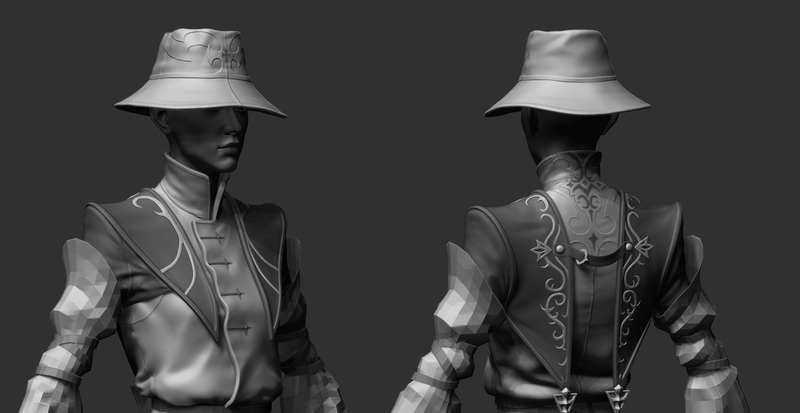 I am currently working on the retopology of the character and I will test bake as it is now. 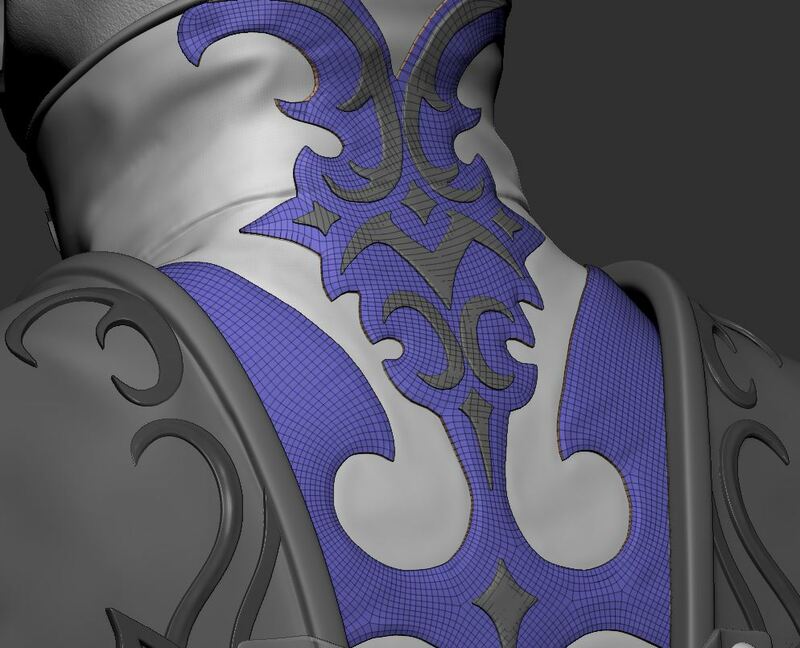 But if it feels bad on the bakes I will spend some time getting in a bit more of those details. Great spotting! 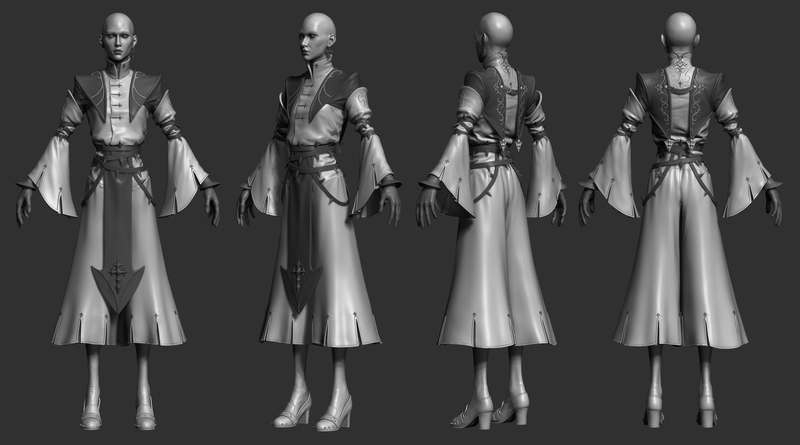 For now I have finished the book and I am currently retopologizing the character. 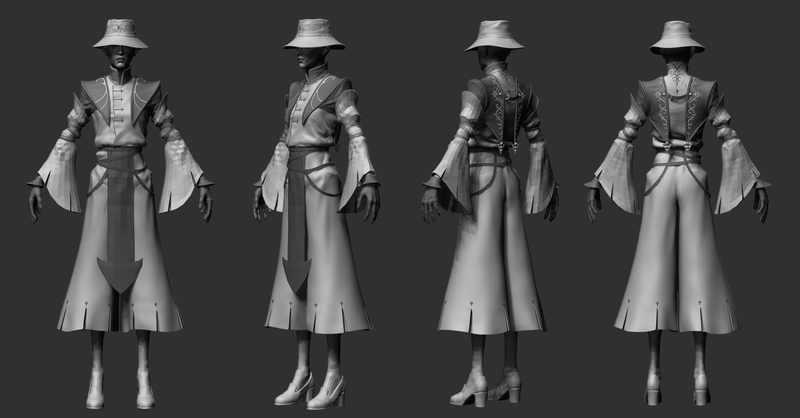 I have retopoed the body, baked the base textures and started to texture her. 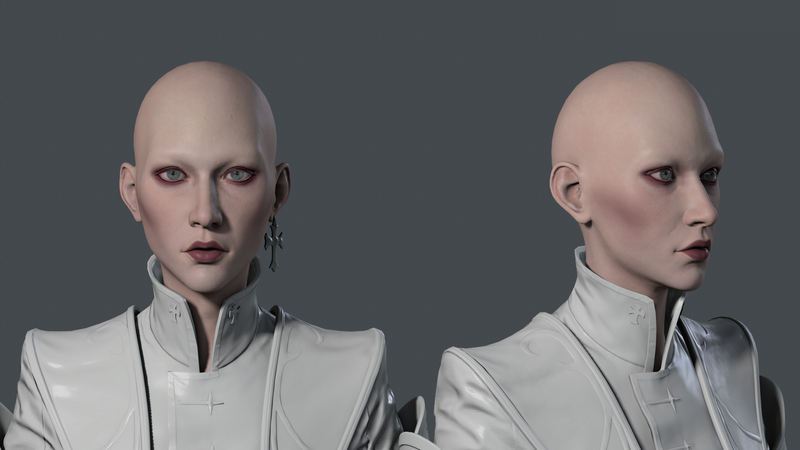 I still got some stuff left on the face, but I will tomorrow start on her hair as that and retopoing and baking the book are the large parts left to do! Then it is to texture her body and the book which will be great fun! The body is on 2 textures sets of 4K each, divided in to cloth and the other one being leather and details. 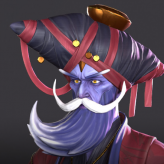 The face is right now on a 4K texture map. 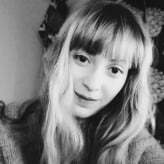 Currently working on the hair, still got transitional haircards and more flyaway to do, but any thoughts would be lovely on the progress so far. Nice start @Nuclear Angel in addition to the transitional and flyaways. I believe you could use a layer or two of break up.